Foxconn Technology Group has announced a $1 million "Smart City, Smart Future" competition to encourage innovative ideas from higher education students and faculty around the state of Wisconsin. 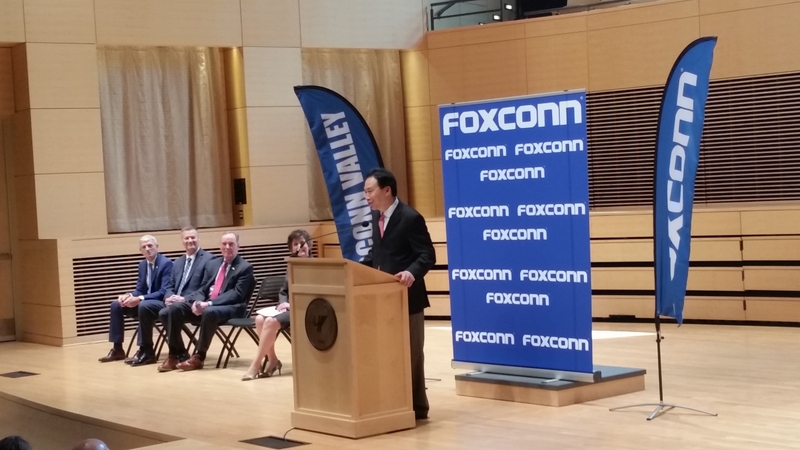 Foxconn's Director of U.S. Strategic Initiatives Alan Yeung announced the effort Thursday morning at the University of Wisconsin-Parkside and was joined by leaders of UW-Parkside, Marquette University, Gateway Technical College and the Wisconsin Economic Development Corp.
Foxconn is building a massive LCD display screen factory in Racine County. Early this year, the state's legislative fiscal bureau estimated total state and local incentives to Foxconn could reach nearly $4.5 billion if the company reaches it's goal of creating 13,000 jobs at the factory. "Smart cities mean different things to different people," Yeung said. "If you are a community leader or a political leader, you could be looking at how we can serve our citizenry a lot better. If you are an energy provider, we want to bring in sustainable energy and actually have a grid that would connect to different places." But Yeung says smart cities have to start with jobs, "because if you don't have growth in population, when people are not staying, it's really hard to have a smart city when they're deserted." Yeung said the competition is "not just for science majors, engineers or technical geeks. Those are welcome. But we also would welcome liberal arts majors — those of you who are writers, creative artists, musicians — we have a place for you." Yeung encouraged students and faculty to think of big ideas, suggesting flying automobiles are someday on the horizon. He said when considering drones are in use and advances are being made in driverless vehicles, "I think we're looking at air spaces, different corridors that can be achieved and accomplished that way." "In fact, that is something on our project plan at the moment. How soon we actually realize that and take it to a road trial I think is going to be dependent on a variety of factors." More details of the Smart City, Smart Future competition will be announced in August at a "Smart Futures Summit" at UW-Parkside.